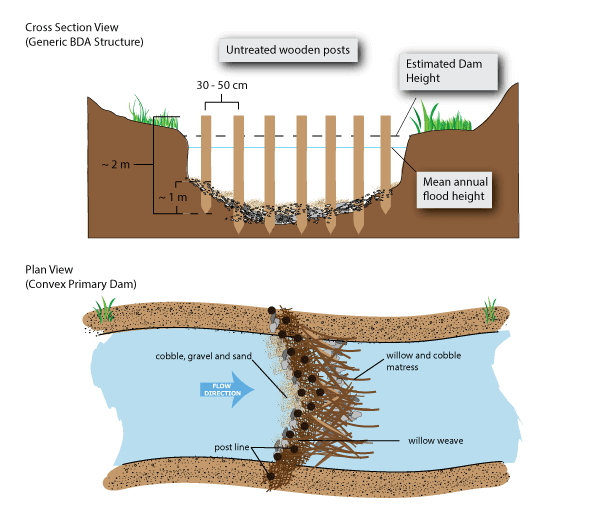 A Beaver Dam Analog (BDA) is a man-made structure designed to mimic the form and function of a natural beaver dam. BDAs can also be used to increase the probability of successful beaver translocation by creating immediate deep water habitat that reduces the risk of predation. 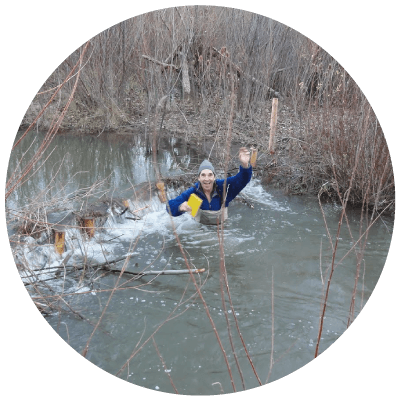 In general, the design and installation of BDA complexes is a simple, cost-effective, non-intrusive approach to stream restoration that can influence a suite of hydraulic, geomorphic and hydrologic processes in order to achieve a range of common restoration goals. A BDA in Bridge Creek filled to the brim with sediment just 2 months after it was built. Where does this BDA thing come from? Michael Pollock testing how deep a plunge pool downstream of a BDA on Bridge Creek was. 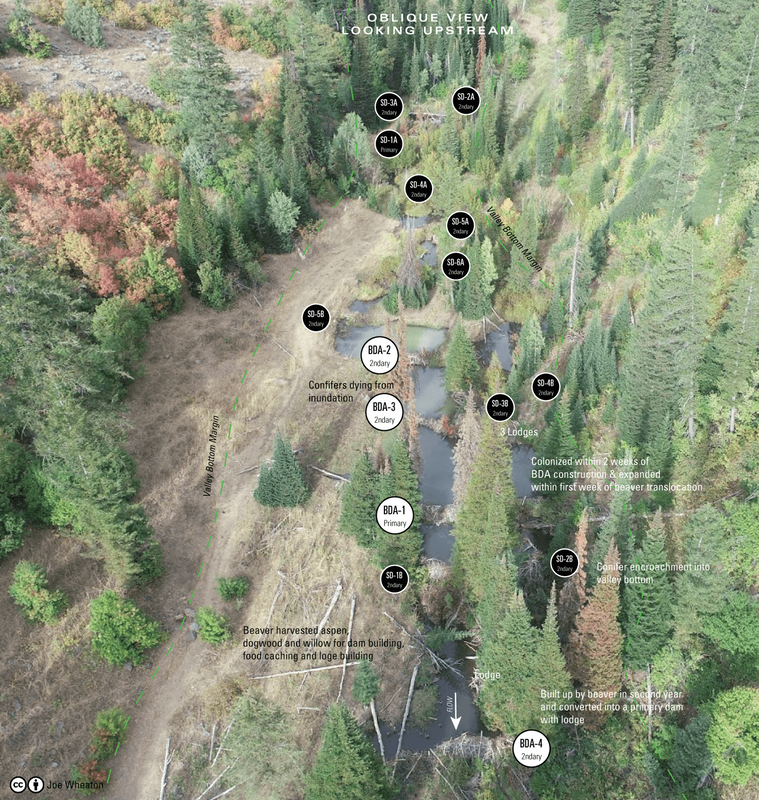 The beaver dam analogue concept grew out of the Bridge Creek Intensively Monitored Watershed project in Oregon. The concept grew out of Michael Pollock, Tim Beechie and Chris Jordan's observations (see Pollock et al. 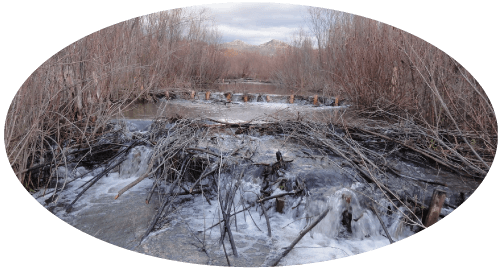 (2007)), of beaver dams in the incised channel of Bridge Creek and a need to get them to last a little longer (> 1 year... but not necessarily decades). We originally called them BDSS (beaver dam support structures) as we were just using untreated wooden fence posts to provide some temporary stability. One evening at the bunk house, we decided to change it to BDAs and the horrible acronym stuck. It now appears in legislation, national and state policy documents, and various versions and perversions of are being installed all over the place. Some are working really well. Most are doing no harm. Many are not clear about their design intent (what is the BDA being used to achieve). A few are being over-built and confused with engineered structures. The Pollock et al. 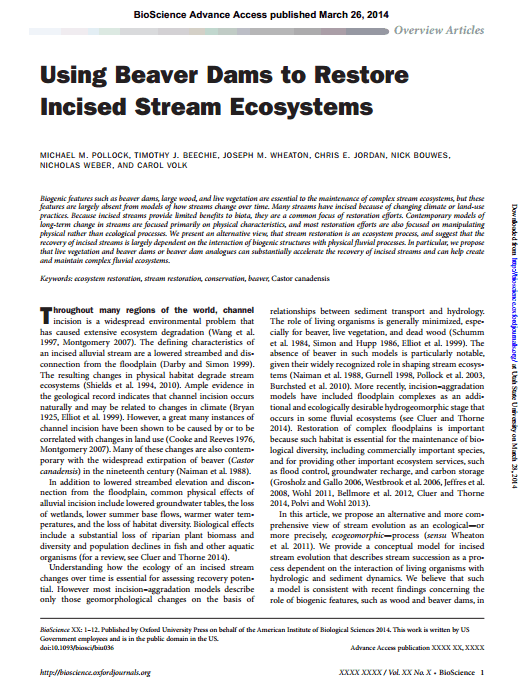 (2014) Bioscience Paper that lays out BDA concepts and specifically how they might be used to restore incised streams. While recipes are helpful when you prepare a new dish or meal the first few times, with experience you become more comfortable adapting the recipe to make it your own. You can substitute ingredients to better match what you might have available in the cupboard (i.e. onsite), and find efficiencies an improvements that work better in your situation. The cartoon at right is something we drew up to show how we were building some BDAs (not all) in a particular setting, for a particular purpose (and with access to plenty of coyote willow to weave between the posts. That simple cartoon has since appeared in numerous permit applications, over-priced 'engineer stamped designs' as a construction detail, and restoration design manuals. Lost in that translation has been some of the common sense that any good cook knows. For example, willow weave is not essential! You can do underwater basket weaving with many different woody materials (so use what is available). However, the important thing is that these things achieve their desired goals, which we need to be clear about. An example of a BDA cartoon (i.e. construction detail) we drew based on Bridge creek. Beaver don't build dams with fence posts, and we don't always need to either. We have played with building postless BDAs (particularly in smaller streams with lower peak stream powers) and they have worked remarkably well. The complex is more important than the INDIVIDUAL bda! A sequence of BDAs in series, collectively forming a dam complex. Focus too much on the individual structure design. Overbuild BDAs trying to make them too stable (e.g. like an engineered structure). The relative importance of individual dams is really low when you have lots of BDAs. Placing a primary dam (larger dam that can support a lodge and often spreads out on to floodplain) strategically within a complex, and then using secondary dams to extend forage access (for beaver), and step down big head drops in smaller steps (by backwater flooding to the base of a taller dam) is far more important. Plus, some failure of individual BDAs is good! 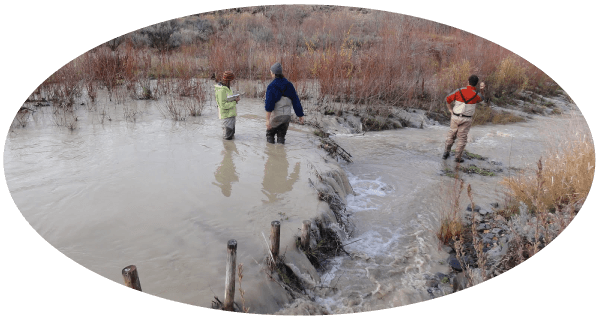 Some of the best instream habitat we've found is associated with failed beaver dams and beaver dam analogues. In our experience, BDAs do not need to last forever. If an engineer asks what is the design life of a BDA, for expectation management we tell them less than a year. It is the wrong question and ignores the importance of these things having variable lifespans. However, for practical purposes, most BDAs last years (and some will likely last decades). The important thing is not to over-build them. A good rule of thumb is to not use heavy equipment and just rely on hand labor (hydraulic post-pounder is still hand labor). When you have to physically move everything you want to incorporate into that dam with your own hands and back, it keeps you out of trouble. It keeps the focus where it should be, on building more of these things, just effective enough, instead of overbuilding a single, high-risk dam. Example of a BDA complex (white circles) taken over by translocated beaver and expanded greatly into multiple complexes.